#PoisonIvy is finally Holset powered. It’s been a long time coming but it was definitely worth the wait. The swap was a little longer than I imagined it would. 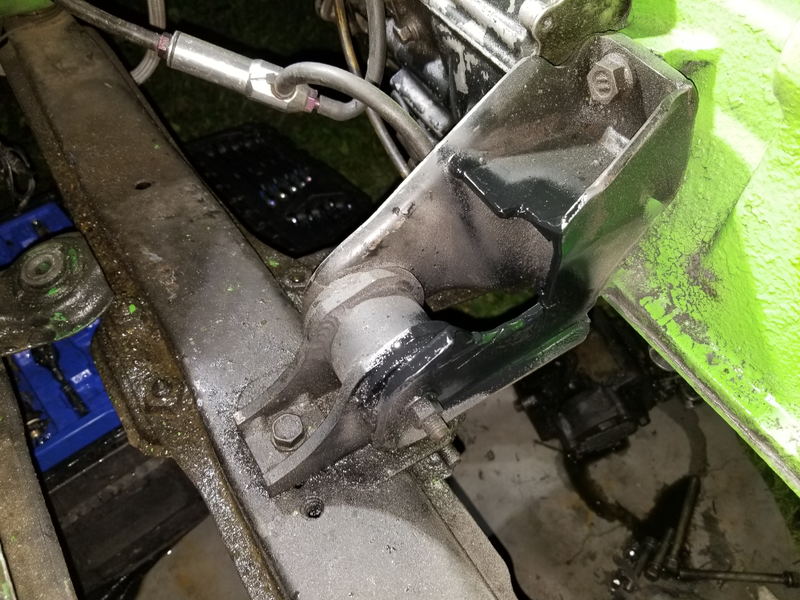 We kept running into issue after issue, mostly clearance related. But in the end, it all worked out very well and I am happy with the HY35 all around. For an in dept, detailed tech article of the HX35 swap, click this link here. One by one, all the parts began to arrive at my house. The turbo came in the mail right before I was heading out to work. I was running late but of course, I had to open up the box and have a look. The HY35 was immaculate. Down to every last detail of the whole unit was pristine. Justin Whitesell does amazing work and I will continue doing business with him for a long long time. 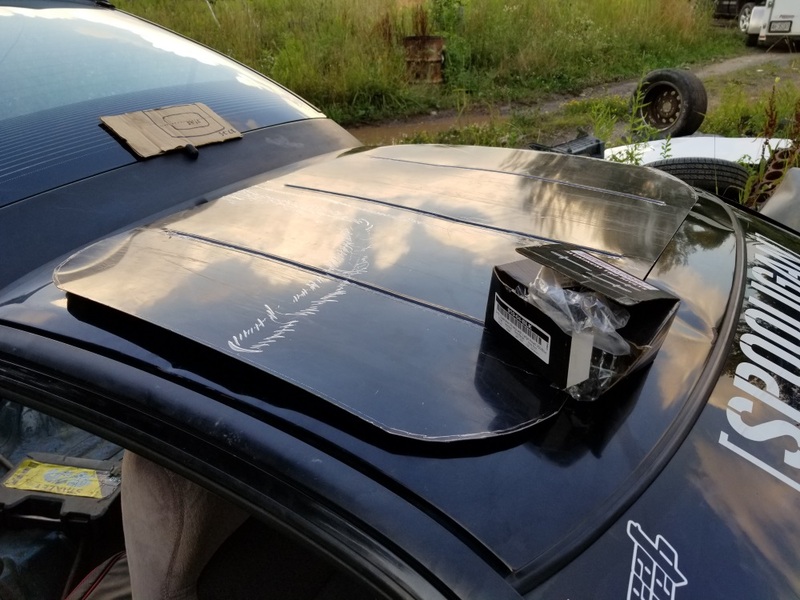 I was fortunate enough to mock everything up on a 6 long block that I had sitting in my living room, just waiting to be sent out to the machine shop. 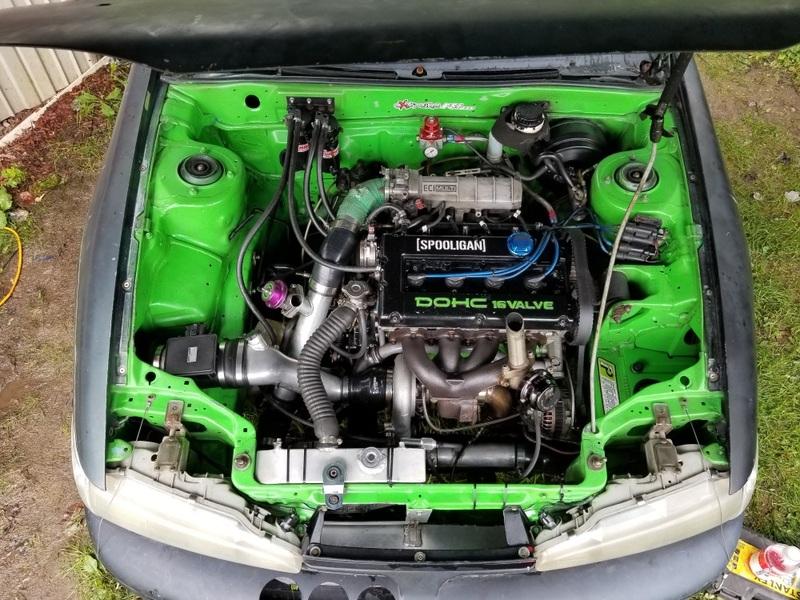 The plan was to completely assemble everything I possibly could on the long block. 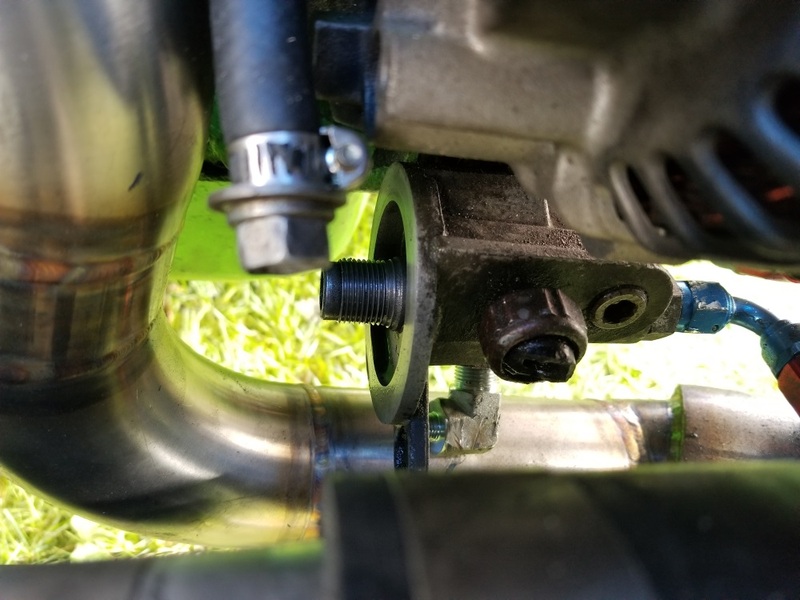 Then all I would have to do was yank off the 16G setup that was on the car and simply slide the new HY35 setup on the exhaust manifold studs. 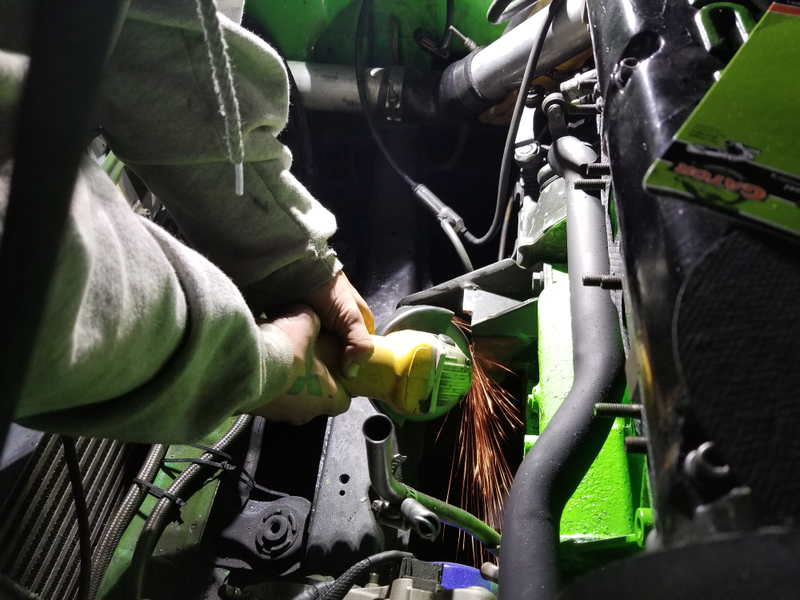 The biggest job assembling everything on the long block was building an oil return line. 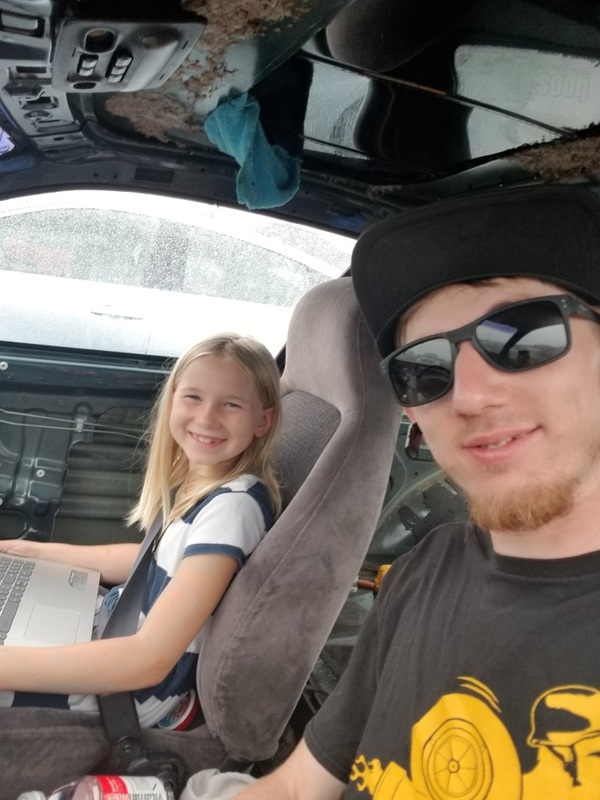 I could not imagine trying to do this with the turbo in the car. 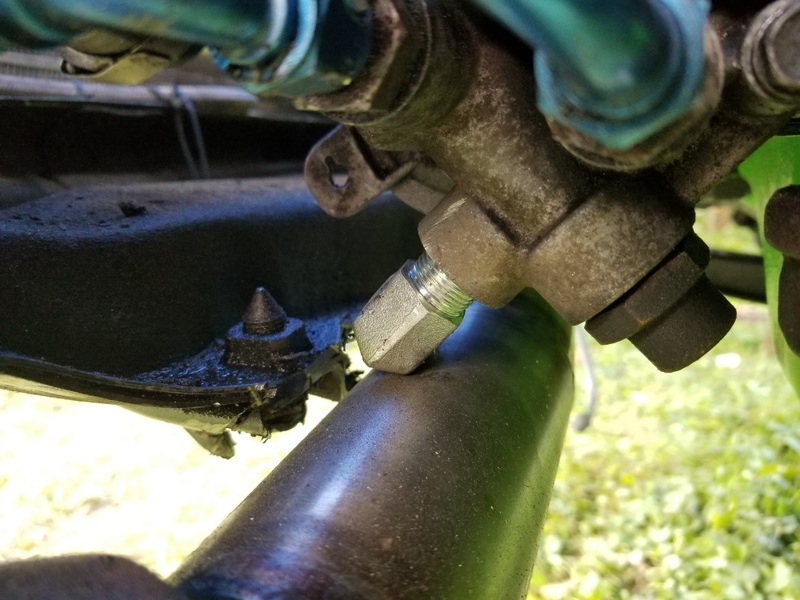 I bought 12AN hose, fittings, and 12AN oil pan bung off Summit. Then I bought the section that bolts to the turbo on eBay. I used a 60 degree fitting off the pan and a 30 degree fitting off the turbo. I only needed a couple of inches of hose to complete the return line. 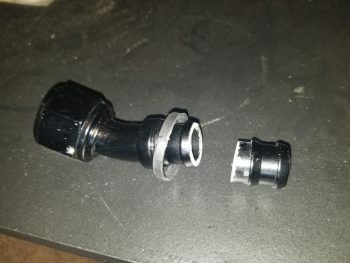 I had to cut off a section of each fitting to connect the hose. Everything was going about perfect until I went to drop the turbo into the car. 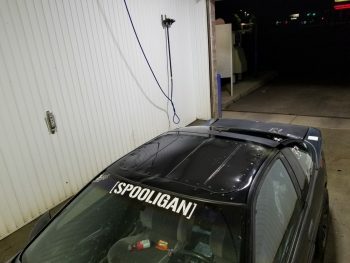 Several modifications were required. 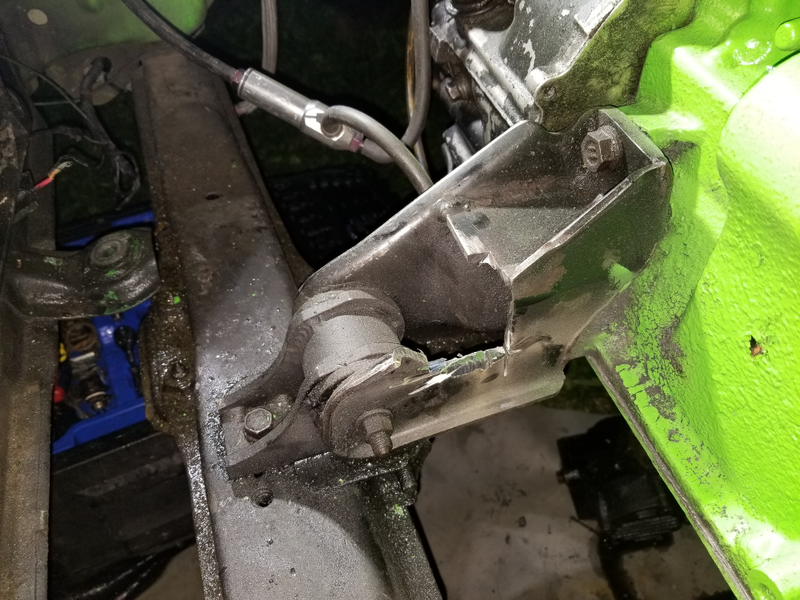 First, I had to hack up the front roll stop engine mount in order for the return line to fit down in without making contact. This is very common when upgrading to a larger turbo. 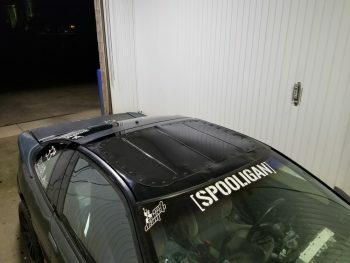 Once we got the mount cut and the return line cleared, we ran into clearance issues with my BSFAB front bumper exit. I had to completely remove the vertical (front to back) subframe brace. Again, this is common. Once that was out, we had to grind down the left front section of the unibody so the exhaust would fit. 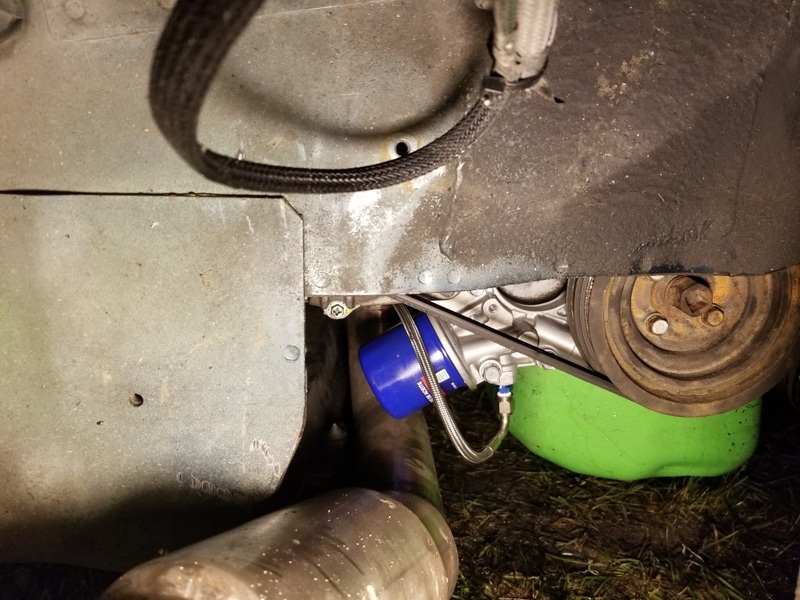 Finally we got it to work but then realized there was absolutely no way an oil filter would go on without a forward facing oil filter housing. 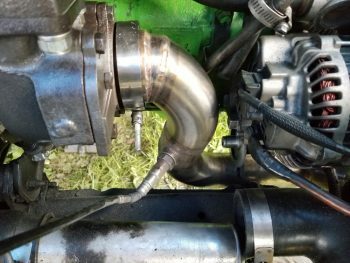 The fitting that threaded into my 1990 OFH also would not clear the exhaust. 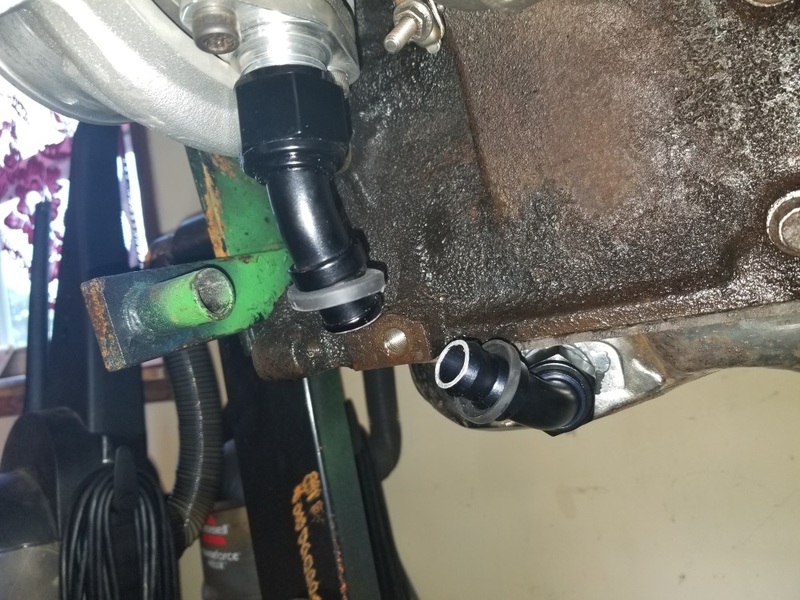 I originally planned on running an oil filter relocation kit with my FFOFH. I bought the FFOFH on Extreme PSI and also bought everything needed to run a filter relocation. Once I put the FFOFH on, there were absolutely clearance issues and I opted to run a filter directly on that and not use the relocation kit. 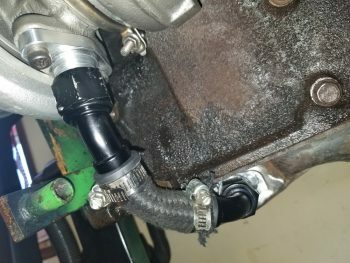 The biggest reason I decided not to run the relocation kit was that the FFOFH is not cooled, neither air or water, like the rest of the turbo OFH’s. 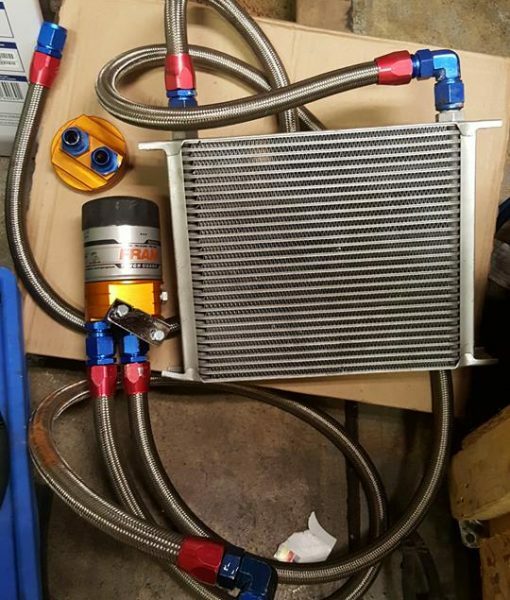 This isn’t a problem but I planned to keep my external oil cooler with the relocation kit. 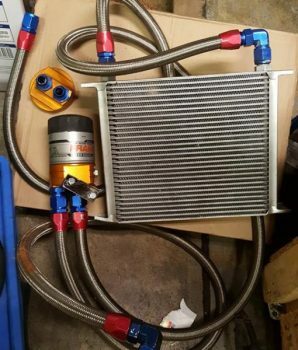 If I ran a cooler, the oil would be cooled all the time whereas with a normal OFH, the factory oil cooler section of the housing is thermostatic and only allows oil to run to the cooler once it reaches a certain temperature. If the oil was being cooled all the time, it would make the oil pump would much harder not only to be pumping oil through a cooler all the time, but pumping cooler, thicker oil all the time. 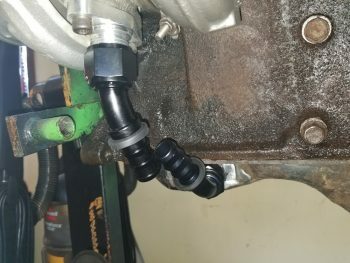 The only reason I wanted to run the relocation kit was so I could retain the oil cooler as the FFOFH does not have provisions on the housing for oil cooler lines. The remote filter assembly I purchased had 4 ports and I was going to run a setup similar to the one in the picture below. The next issue I had once the FFOFH was on was that the oil feed line hole on the housing was much smaller than the one on a normal turbo OFH. It was 1/8” BSPT whereas the turbo housing feed hole is 3/8”BSPT. I lucked out and found a local machine shop that had a couple fittings. I bought one straight fitting and one 90 degree fitting. Each were 1/8”NPT x 4AN. 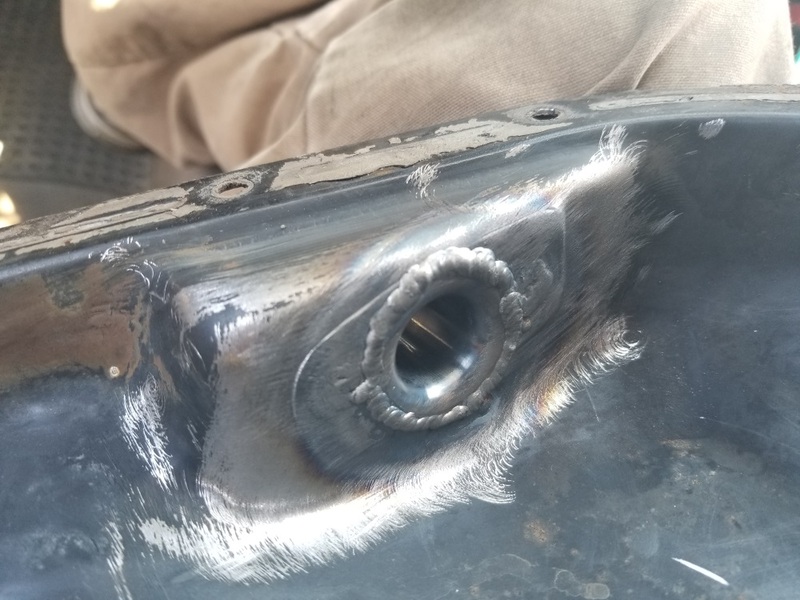 So, I bought them and retapped the 1/8”BSPT hole to 1/8”NPT. As recommended by Justin Whitesell, I used a 12AN return and a 4AN feed. Most people run a 10AN return line because they are easier to buy. Even Extreme PSI doesn’t sell a 12AN return line kit, you have to make them. I easily had about $150 invested in just my return line alone. 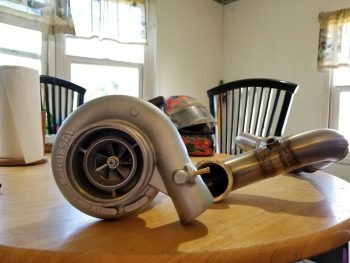 You need to run a 12AN return to provide ample flow out of the turbo. A 10AN line will slow the oil flow down and raise your oil pressure. Then you will need to run a restrictor to lower the feed line oil pressure. 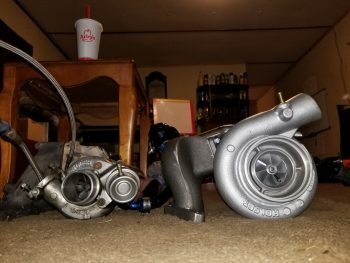 This can easily cause turbo failures. 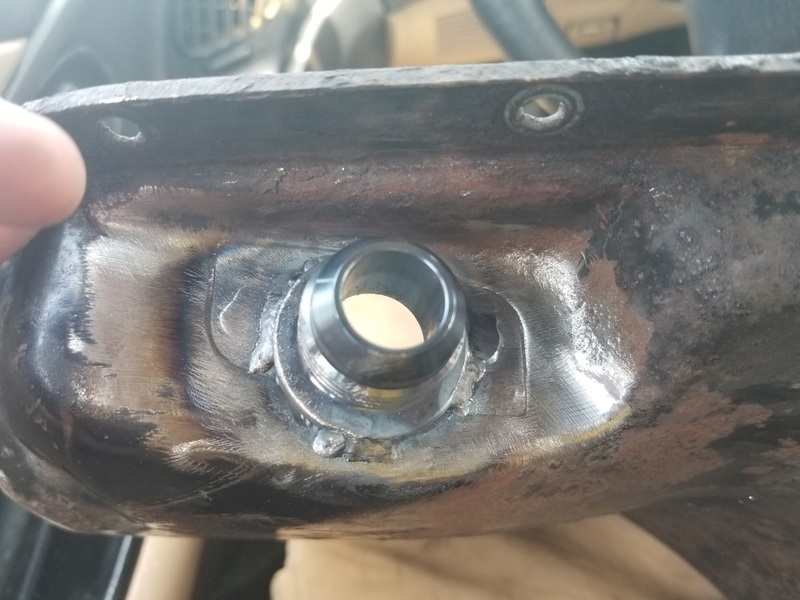 It is also very important to bore out the oil pan hole to match the oil return bung that you welded to the oil pan. You don’t want to disrupt the oil flow in any way. Finally, the turbo was on, the exhaust fit, and I was able to fire it up. I purchased a 4” x 2” reducer coupler to use my intake pipe with the 2G MAF just to get the car dialed in before switching to speed density. 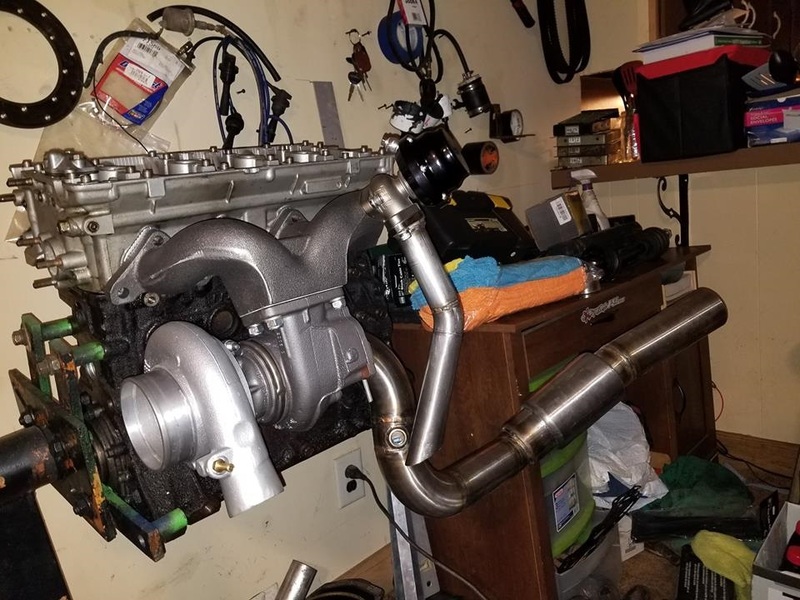 The car is tuned now for this turbo so once I get my IAT bung welded onto my intercooler pipe, I will begin SD tuning and run a 4” FP intake pipe. The car pulls much harder than the 16G. Currently, I am running close to 25PSI. My PTE 1000cc. fuel injectors will need to be upgraded before I can turn the boost up much more as my IDC is around 75-80%. That will definitely have to wait until after the DSM Shootout. Prior to doing the HY35 swap, I ran up to my dad’s and we made a new sunroof delete panel. 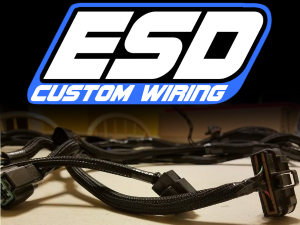 I used some black on black sheet metal that our dirt modified bodies are made out of. 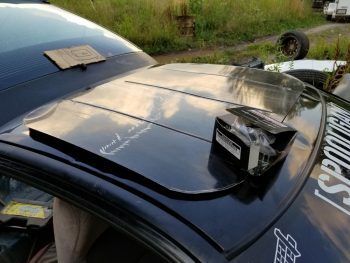 I applied some waterproof silicone to seal it up, then rivetted it down onto the roof. We put a few beads in the panel with the sheet metal brake to add a little more support. It looks much better than the old plug that I had duct tape on.